Tobias Hanraths sees nothing but gray skies ahead. At the end of any good western, the hero rides off into the sunset. His work is done and new adventures wait for him beyond the horizon. Yet, westerns never show what lies beyond that horizon. The reason? It may be that a place like Blackwater, the final destination of John Marston – the hero of Red Dead Redemption – is what awaits them. By the time Marston settles just outside of Blackwater, he has seen some of the worst the Wild West has to offer. He has fought with criminals in the mud of Thieves’ Landing, he has shot people in the dust of Armadillo, and he has conspired with con artists, drunks and arsonists. He has also gone to Mexico, a beautiful country embroiled in a bloody – and senseless – civil war. Yet, of all these places, Blackwater is the worst. When Marston first arrives in Blackwater, his mission is to find his old gang from his days as an outlaw and bring them to justice. Sure, he can bring them in alive, but the government would much rather have them dead, thank you very much. Marston doesn’t really want to do it, but he also doesn’t really have a choice: The Bureau of Investigations (BOI) is holding his wife and his son hostage. If he ever wants to see them again, he needs to make some tough choices and kill some of his old buddies. So, you can forgive him if his view of Blackwater is a bit tainted. Of course, the people of Blackwater might not agree; they seem to be happy enough. And why wouldn’t they be? From their point of view, the city is a beacon of civilization in an ungodly country. There are cobblestone streets and street lamps, a telephone line, and working law enforcement. There are doctors and shops and newspapers. 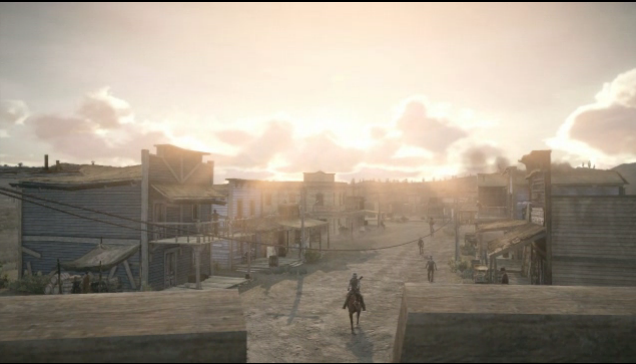 For Marston, though, the town’s growth and development are just a reminders that his way of life is over. Despite his reluctance to be there at all, there’s no denying the deserts and prairies of Blackwater are where Marston seems most at home and alive. At the top of a horse, standing on a cliff, staring out into a breathtakingly big country under a glorious sunset: this is exactly where he wants to be – only not as an outlaw, but as a farmer. Blackwater doesn’t have room for that; it’s a city on the verge of an industrial boom, the rural landscape giving way to more urban sprawl. Horses are slowly being replaced by the first automobiles. Instead of a big country for crops and livestock, there are wide roads and tall houses. Even the sun never seems to break through a thick set of clouds. Sure, they still have a saloon in Blackwater, with all the drinking and gambling you’d imagine, but it feels sanitized, and safe. When one of the newspapers announces a Wild West show coming to town, it’s not really a surprise. Manufactured excitement fits right in here. Still, after Marston’s work for the Bureau is done, he tries to fulfill his small, simple dream by building a home. It’s a beautiful place, situated near a crossing of roads in a piece of land called Beecher’s Hope. Nothing fancy, just a house, a barn and a water tower. Some land for the cattle and the horses. And for a while, he’s happy there, teaching his son how to hunt, herding cows, spending time with his wife. 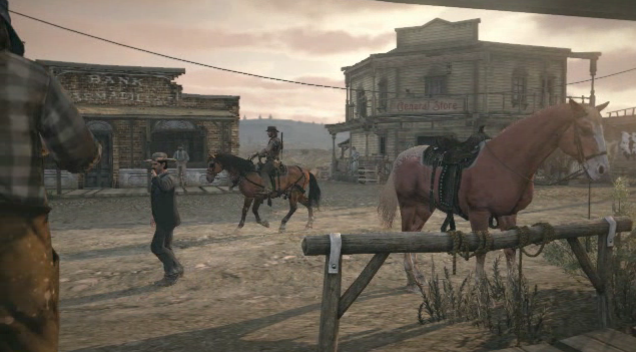 But the truth is, Marston stayed too close to Blackwater and it’s perpetual gray sky. The cloud were always hovering on the horizon reminding him he was in easy reach. And so one day, when the Bureau needed to tie up yet more loose ends, they came for him. And they killed him. The tragedy is that Marston expected it. He knew the authorities couldn’t leave him alone, not with his past and his knowledge. But he probably felt it too, walking the streets of Blackwater. Just a whisper, in the back of his head: there is no place for you here, no place left for living free. We are here now, and we brought our civilization and our modern life with us. Get out of the way or die. Could he have gone someplace else? Sure he could have. But it would only have bought him a bit more time. Blackwater isn’t some anomaly in an otherwise wild frontier, it’s the new standard. The road through Armadillo may stay uncobbled and dusty for a while. Thieves’ Landing might honor its name just a little longer. The farmers in the middle of nowhere might go unbothered. And just for some years, the sky may stay blue. But the clouds are coming.